“When I write, I feel alive," says Norman Vincent, as he grips a pencil and shares from his journal. Thanks to a unique writing program, a group of senior citizens have been transformed into powerful poets and storytellers. The Columbia Basin Care Writers is comprised of residents who gather to read, write and share. Through writing prompts and conversation, members mine past and present for stories and poems. With the help of staff and volunteers, writers are guided through games and exercises to rev up the creative process. 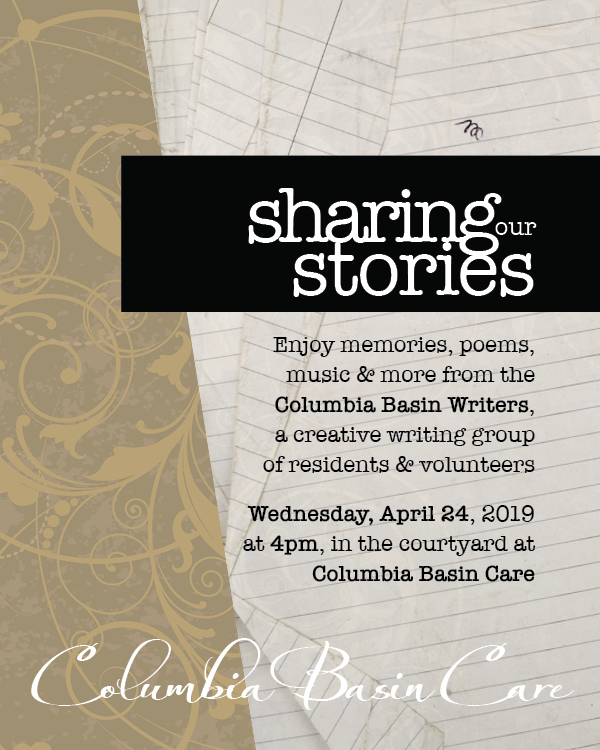 In conjunction with National Poetry Month, Columbia Basin Care is hosting Sharing Our Stories on Wednesday, April 24 at 4pm. Now in its second year, the event features the Columbia Basin Care Writers, along with music by local pianist Rule Beasley. The event is free and open to the public. Writing programs are frequent among youth but few programs are in place for senior citizens, and even fewer for those living with dementia. For those who struggle with the physical act of writing, volunteers take dictation and offer kind nudges. For some, just a little encouragement stirs a rush of memory, and emotion too. "This is amazing," says Merla Biggins, a member of the writing group. "The thoughts come so fast, I can't grab them all." Studies have shown older adult literary programs, such as reading poetry and writing memories, can have significant impact on mood, concentration and social interaction. Research has also demonstrated improvements in short and long-term memory and listening skills. The Columbia Basin Writers has a dozen members, ranging in age from 66 to 99. Not a single participant has prior writing experience, though you wouldn't know it based on the enthusiasm of the group. Delores Cooper never considered herself a writer. Now, gathered in a room filled with laughter and ease, she’s one of the group’s most dedicated members. “The more you do it,” she says, "the easier it gets." Columbia Basin Care has earned the Pinnacle Customer Experience Award, achieving a “Best in Class” distinction for the third consecutive year. With this accomplishment, Columbia Basin Care has met the rigorous demand of scoring in the top 15 percent of the nation across a 12-month average. Serving the community for over 50 years, Columbia Basin Care places strong emphasis on meeting the individual needs of every resident. The Customer Service Award is awarded to care providers who have achieved best-in-class customer satisfaction standards. Columbia Basin excelled in every service area with top ranking in: Overall Satisfaction, Cleanliness, Individual Needs, Communication from Facility, Dignity and Respect, Recommend to Others, Activities, Admission Process, Safety & Security, and Overall Customer Experience. The award is granted by Pinnacle Quality Insight, a national customer satisfaction firm that regularly conducts interviews with residents (and their families) of Columbia Basin Care regarding their satisfaction levels. Every month, Columbia Basin Care reviews these survey results in order to gain a better understanding of resident needs and make improvements when necessary. Columbia Basin Care, located in The Dalles, is the region’s only non-profit, community-owned facility for short-term rehabilitation and long-term care. CBC offers the area’s only in-house geriatric nurse practitioner, along with a team of licensed physical, occupational and speech therapists who provide comprehensive rehabilitation and restorative services. Veronica Quintero, certified nursing assistant, is embraced by Eva Phelps, a resident at Columbia Basin Care. Veronica has been named Oregon Caregiver of the Year. Veronica Quintero’s wide, friendly smile and upbeat personality can’t help but brighten almost any dark day. But that’s just a small part of what makes her one of the best certified nurses’ aides in Oregon. The Columbia Basin Care nursing assistant holds the current title of Caregiver of the Year, awarded by the Oregon Health Care Association. The honor is awarded to an individual who demonstrates a commitment to quality care through dedication to residents, staff and the long-term care profession. Veronica says her job serves as a higher purpose. Veronica, 22, has been a nursing assistant at Columbia Basin since shortly after graduating from The Dalles High School in 2014. She took CNA training at Columbia Gorge Community College as a way to start her career in the medical profession. She plans to continue her education and become a nurse. Veronica’s experience working with the elderly is much longer. “My mom was a CNA when I was young and did overnight stays,” she says. “I got really close to one patient and called him grandpa. I would do little things for him like take him water. I just want the feelings of being able to help.” Her own grandparents were a strong influence in her life, and she participated in her grandmother’s care before she died. When Veronica is not caring for the residents at Columbia Basin, she saves her vacation time to work with her mother in a local cherry orchard. Since childhood, she has spent summers in the orchard, often working from dawn to dusk. Working in the orchards with her mother also played a key role in making her the person she is today, Veronica says. She also enjoys attending practices, performances and games with her siblings. “If my brother has a basketball game, I really want to be there,” she says. Veronica also makes time for herself. She enjoys walking her dog, working out at the gym and occasionally hanging out with friends. She also counts cleaning as something she enjoys. Veronica’s schedule at Columbia Basin helps make her other activities possible. Her workday starts at 6 a.m. and ends around 2 p.m., giving her afternoon time to spend with her family. The first few hours at work are focused on getting her charges ready for the day, including things like showers and toothbrushing if needed. “You don’t really think about how much comes in a day until you help somebody do it,” Veronica says. Breakfast is from 8 to 9 a.m. After that, she and the other CNAs work on whatever pops up, Veronica says. “And something will pop up,” she says. A CNA needs to be considerate, compassionate and observant because sometimes the residents can’t express what they are feeling, Veronica says. “What I think of is how I would want my grandfather taken care of,” she says. “They’re depending on us. They come here because they need you, and a good CNA has to be really considerate and really understanding. There’s a lot of pain involved here, and you have to understand that, too. You have to understand what will make them feel better. Sometimes it’s even as simple as giving them a hug. Though young and early in her career, Veronica is seen by her employers as a leader with compassion beyond her years. “Helping is such a natural reflex to Veronica that she doesn’t even realize compassion is part of her every action, both personally and professionally,” says Aubree Olmstead, executive director of Columbia Basin Care. Veronica is also bilingual, which she says can help some residents with an experience that otherwise might be more scary and lonely. Veronica says she has become quite close to some of the residents she has been taking care of for a long time. Some times on the job are a little more crazy than others, Veronica says. CNAs also need to be prepared for the hardest part of the job: when a resident dies. This story originally appeared in Ruralite magazine. Best Nursing Homes highlights the top nursing homes out of 15,000 facilities nationwide. The rating system aims to help consumers determine best options for a skilled nursing facility with a strong track record of good care. More than half the population over 65 years will require long-term care services during their lives, according to Centers for Medicare and Medicaid Services. Earlier this year Columbia Basin Care earned a Five Star Rating from the Centers for Medicare & Medicaid Services (CMS), the federal agency that sets and enforces standards for nursing homes. The Best Nursing Homes rating draws on CMS data that assigns a rating of one to five stars in the areas of health inspections, nurse staffing levels, and quality of medical care. In achieving these awards Columbia Basin Care has demonstrated its ability to meet the rigorous demands of providing around-the-clock medical care in a comfortable, home-like setting. Columbia Basin Care, located in The Dalles, is the region’s only community-owned, not-for-profit facility for long-term care and short-stay rehabilitation. The company offers an in-house geriatric nurse practitioner, along with a team of physical, occupational and speech therapists who provide comprehensive rehabilitation and restorative services. For the full rating report, click here. “My cousins got me started drawing dresses for paper dolls,” she says, chatting on the patio at Columbia Basin Care, where she now lives. This story first appeared in the December 2018 issue of Ruralite magazine. 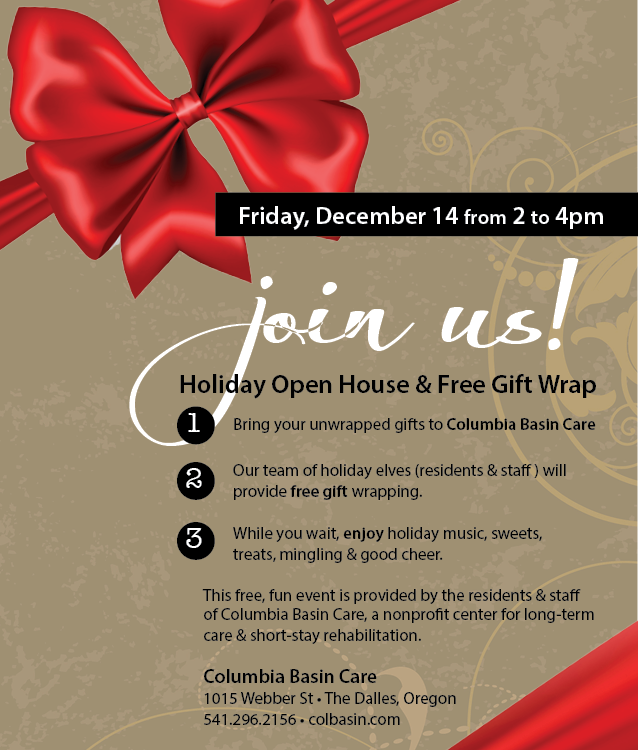 The residents and staff of Columbia Basin Care are merry & bright and wrapping presents with care. Please join us for a relaxed afternoon of music, sweets & good cheer on Friday, December 14 from 2 to 4pm. 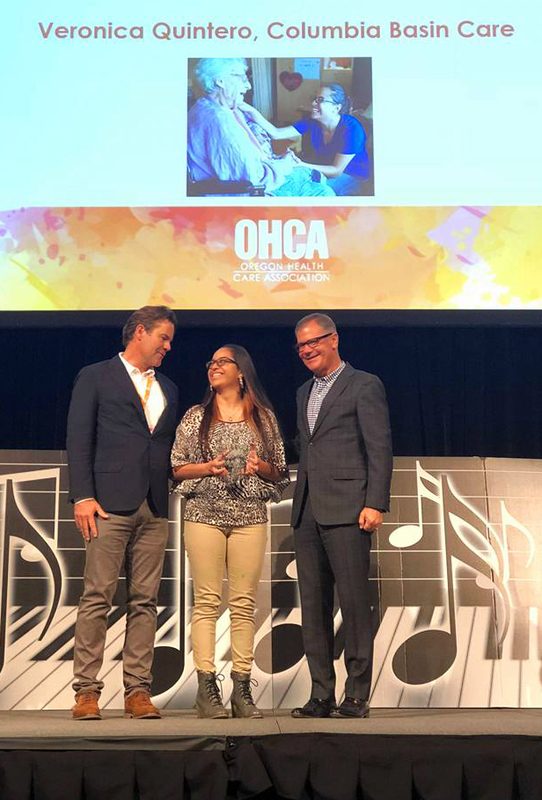 Veronica Quintero, Certified Nursing Assistant at Columbia Basin Care, has been named 2018 Caregiver of the Year by the Oregon Health Care Association. The honor is awarded to an individual who demonstrates a commitment to quality care through their dedication to residents, staff, and the long term care profession. OHCA is the largest long-term care trade association in Oregon, representing 1,000 organizations and nearly all long term care providers in the state. Columbia Basin Care, located in The Dalles, is the region’s only community-owned, not-for-profit facility for long-term care and short-stay rehabilitation. Founded in 1964, Columbia Basin Care employs 100 people and has served the community for over 50 years. Humble and energetic, Quintero has worked at Columbia Basin Care for three years, and serves as a mentor to new aides, working side-by-side to share proper protocols and procedures, infused with empathy and warmth. “I just like to help,” says Quintero, with a smile and a shrug. When she’s not caring for others as a full-time CNA, she is saving up her vacation time to work with her mother in the local cherry orchard. Since childhood, she has spent summers in the orchard, often toiling from dawn to dusk. “I like helping my mother. That time together is so special,” says Quintero. Twenty years ago a small group of volunteers made a difference that has dramatically impacted The Dalles and neighboring communities. Three determined folks — John Byers, Linda Omeg and Mike Courtney — went to work transforming Columbia Basin Care into a rare and special thing: a not-for-profit facility providing award-winning medical care and comfort. Today, Columbia Basin Care is the region’s only community-owned, not-for-profit, nursing facility for short-stay rehabilitation and long-term care. Founded in 1964, Columbia Basin Care has operated as a not-for-profit business since 1997 — that’s over 20 years! With a team of 100 people, the company is one of the area’s largest employers. Columbia Basin Care operates with a volunteer Board of Directors. The founding members: John Byers, Mike Courtney and Linda Omeg were later joined by Carla Chamberlain and John Hutchison — all of whom still serve on the board today. Aidan Health Services, a management company, provides oversight and support. While Wasco County owns the building and grounds, Columbia Basin Care is an independent compa­ny with local control and decision-making authority. As a non-profit, there are no owners or investors, and funds are dedicated to staff, equipment and facility upgrades, such as the recently renovated courtyard and park — all improvements that increase quality of life for residents. Advocating for quality medical care in a comfortable setting, these board members have firsthand experience. John Byers rehabilitated at Columbia Basin after major surgeries and took part in the physical and occupational therapy services. Other board members have had family recover at the facility, too. “It’s been around so long that almost everyone has known someone — mothers, fathers, aunts, uncles — who has known Columbia Basin,” notes Byers. In the U.S., nearly all nursing homes — 70 percent — are for-profit facilities, according to the Center for Disease Control. In Oregon that number is even higher: 80 percent of nursing homes operate as for-profit facilities, with just 17 percent operating as not-for-profits, and three percent are government-owned. Most experts agree that a quality facility is based on staffing levels, and note that for-profit facilities — and particularly large corporate chains — may cut corners to save money and boost profits. Nurses working in nonprofit nursing homes are significantly more satisfied with their jobs, according to a study of 900 registered nurses working in 300 skilled nursing facilities. A similar study show certified nursing assistants are more satisfied and preferred working in non-profit facilities. Aubree Olmstead, executive director of Columbia Basin Care, can see the difference. Under her helm, CBC has seen a dramatic reduction in employee turnover and an increase in job satisfaction among staff (measured through anonymous surveys). Long-term care is an industry that typically sees high turnover — 60 to 80 percent is standard — and that affects both residents and staff. The answer, say many, can be found in non-profit care facilities, places that put people before profit. “I’m not a writer,” cautions Patty Geiger. Moments later, she shares a vivid poem that recalls making hot chocolate with her mother years ago. Meet the Columbia Basin Writers, a group of senior citizens transformed into powerful poets and storytellers. 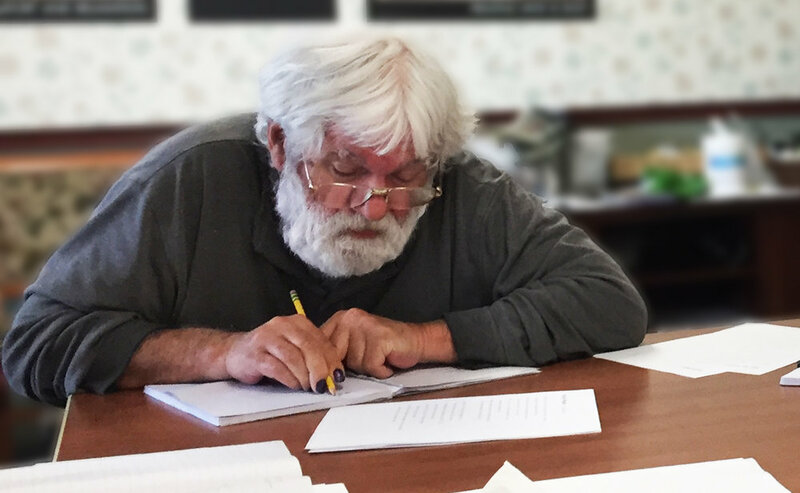 Comprised of residents of Columbia Basin Care, a care facility in The Dalles, the Columbia Basin Writers gather once a month to read, write and share. Through writing prompts and conversation, members mine their past for stories and poems. With the help of staff and volunteers, writers are guided through games and exercises to rev up the creative process. For those who have difficulty with the physical act of writing, volunteers take dictation and offer kind nudges. For some, just a little encouragement stirs a rush of memory, and emotion too. “When I write, it’s from here,” says Sandy Pishion, placing her hands across her heart. Studies have shown older adult literary programs, such as reading poetry and writing memories, can have significant impact on residents’ mood, concentration and social interaction. Research has also demonstrated improvements in short and long-term memory and listening. While writing programs are frequent among youth, few programs are in place for senior citizens, and even fewer for those with dementia. In April, in conjunction with National Poetry Month, Columbia Basin hosted a party for writers to read their words aloud. Against a backdrop of a sunny day, festive food, and music by local pianist Rule Beasley, the Columbia Basin Writers shared their work to a rapt audience. We’re looking and feeling good, thanks to Leanna McDowell, our on-site hairdresser. Leanna offers cuts, curls, style & color for men and women — and serves residents, staff, and the community-at-large. Her skill and enthusiasm is matched with warmth and kindness. Born in Portland, Leanna has lived all over the U.S. and now makes her home in Dufur. She is an instructor at Gorge Academy of Beauty in The Dalles and has a passion for color. Leanna is typically available Mondays and Tuesdays. To make an appointment, place your name on the reservation form located outside the Salon, located on the first floor, across from the Activity Room. Leanna joined Columbia Basin last fall and has found a second home among new friends. “I’ve been so embraced by everyone here, the residents, and nurses, and all of the staff!” she says. While our expert team of physical, occupational and speech therapists provide rehab care for short-term residents, Columbia Basin offers programs and activities to keep long-term residents active and healthy too. The Restorative Exercise programs offer short supervised exercise sessions led by a licensed Restorative Aide. Exercises are tailored to individual needs, and take place in the second floor therapy room. The space is equipped with a variety of exercise equipment, including bicycles for strengthening and grab bars for balance exercises. Sessions typically run 15 minutes, two to three times per week. Most everyone looks forward to their session, says Marlene Marick, the licensed Restorative Aide overseeing Columbia Basin’s exercise program. Approximately 25 residents take part. In addition, a variety of games and activities complement the structured exercise sessions. Bean bag toss, bocce ball, and whack-a-noodle (held in the Activity Room on the first floor) are excellent opportunities to stretch and strengthen muscles, and also improve balance and mobility — while having fun. She’s always happy to head to the therapy room for a session of restorative movement. Thank you for considering Columbia Basin Care. As the region’s only community-owned, nonprofit, skilled nursing facility, we have a team of professionals eager to help fulfill your needs for long-term care and short-term rehabilitation. Let’s work together toward our shared goal: health, happiness & safety for all. Columbia Basin Care Earns Top Rating! Columbia Basin Care has earned a Five Star Rating from the Centers for Medicare & Medicaid Services (CMS), a key branch of the U.S. Department of Health and Human Services. The Five-Star Quality Rating System is a tool to help consumers, their families, and caregivers easily compare nursing homes. The overall rating is determined by health inspections, nurse staffing, and quality of medical care, and provides a quality rating system — between 1 and 5 stars — for every nursing facility in the nation. 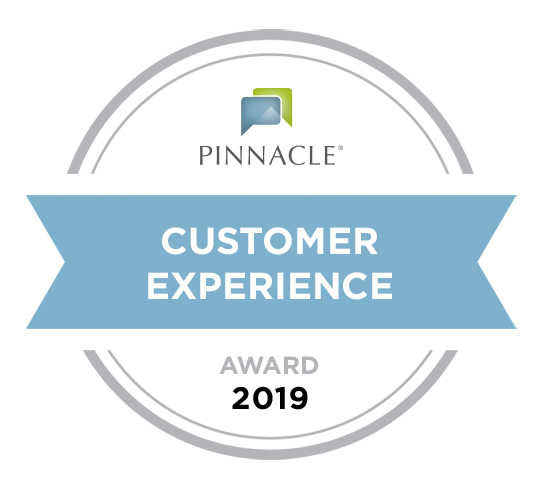 In addition, Columbia Basin Care has earned the Pinnacle “Customer Experience Award,” achieving a “Best in Class” distinction in 2017 and 2018. The award is granted by Pinnacle Quality Insight, a national firm that interviews residents of Columbia Basin Care regarding their satisfaction levels. HAPPY DAY: Laura celebrated her birthday with a party of friends and staff, including Aubree Olmstead, Columbia Basin Care’s executive director. What’s the secret to a long life? Depends when you ask. Ashbrenner, an accomplished fashion illustrator and artist who has dedicated much of her life to capturing the beauty of the Columbia Gorge, turned 103 on October 3, 2017. She was born in Battleground, Washington in 1914. After high school, she attended Oregon School of Fine Arts and built a career as an artist for advertising agencies. In the 1930s and 40s she worked as a fashion illustrator for top Portland retailers, including Meier & Frank department store. Her work frequently appeared in the Oregonian and The Oregon Journal newspapers. Edgar (Ed) and Laura, along with their three children (Vern, Janet, and Marcie) moved to The Dalles in 1957. Stunned by the unique landscape, Laura turned her focus to capturing its beauty. Many of her landscape paintings are on display at Columbia Basin Care, and her artwork is often seen for sale at online auction and collector sites such as ebay. Laura and Ed were married 75 years. Ed passed away in 2013 at the age of 106. Known for her sweet nature and quiet talent, Laura is an inspiration to many. Even now, she’s still painting. 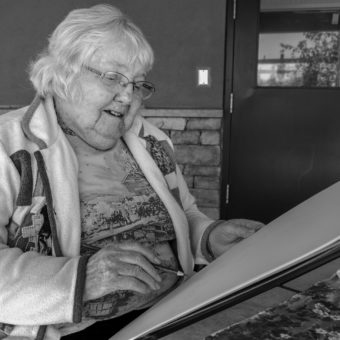 Just days before her birthday, she has a sketch pad in hand at Columbia Basin Care, a long-term care facility in The Dalles, Oregon. A stroke left Wilma without words but a friendly dog speaks the language of a wagging tale. The best medicine, it turns out, isn’t a pill or procedure, but Bomber, Belle, Snowball and other furry friends. Thanks to partnerships with Home at Last Humane Society and Heart of Hospice, residents of Columbia Basin Care are enjoying weekly boosts of comfort, joy and good health — in the form of visiting cats and dogs. The nonprofit care facility, located in The Dalles, is home to over 60 senior citizens, many with acute health challenges who respond to the love and attention of a friendly animal. Increasingly, research shows happiness is a warm puppy, just as cartoonist Charles Schulz told us years ago. Studies show as little as 15 minutes of bonding with an animal sets off a chemical chain reaction in the brain, lowering levels of the fight-or-flight hormone cortisol and increasing production of the feel-good hormone serotonin. The result: heart rate, blood pressure and stress levels immediately drop. Over the long term, pet and human interactions can lower cholesterol levels, fight depression and may even help protect against heart disease and stroke. Using animals to offset emotional and physical problems and improve quality of life is especially helpful for seniors, who with the loss of mobility and independence commonly experience loneliness and depression. Each week Rheva Wren, with Heart of Hospice, brings her dog, Joki the Goldendoodle, to Columbia Basin Care. The results are often profound. And often, she adds, it’s the caregivers who appreciate a snuggle. Columbia Basin requires visiting pets be calm, friendly and obedient, with certification of immunizations. And while seniors enjoy the licks and wags, they aren’t the only ones benefitting.